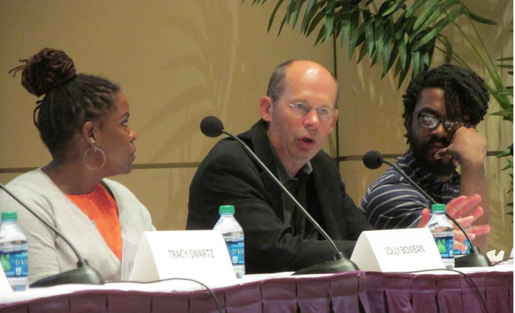 Panelists at the Truth & Trust symposium (left to right): Lolly Bowean, Alex Kotlowitz and Darryl Holliday. Photo by Colleen Connolly. Last week, PBS MediaShift and the Poynter Institute produced a great symposium, “Truth & Trust in the 21st Century: Journalism’s Role in Telling the Story of Violence in Chicago.” The event was sponsored by Northwestern University’s Medill School of Journalism, the Robert R. McCormick Foundation, the Gannett Foundation and PR Newswire. It featured a conversation about how journalists can best cover violence in a way that empowers and informs communities. Industry experts and reporters gathered at Northwestern University School of Law’s Thorne Auditorium in downtown Chicago to hear from panelists including the Chicago Tribune’s Lolly Bowean, DNAInfo’s Darryl Holliday, Englewood blogger Asiaha Butler, the Chicago Sun-Times’ Homicide Watch editor Michael Lansu, Chicago Tribune RedEye reporter Tracy Swartz and author Alex Kotlowitz. The discussion was moderated on stage by Poynter’s Kelly McBride and CBS 2 anchor and reporter Jim Williams, with PBS MediaShift’s Mark Glaser moderating the audience participation. We’ve rounded up a great collection of photos, coverage and a Storify from the Truth & Trust symposium. Did we miss anything? Please add it in the comments, and we’ll update the post. We also expect to have video from the event soon. Colleen Connolly shot some great photos of the reception and the symposium. See below for our own curated collection from Truth & Trust. Angela Washeck is a freelance writer and editor based in Dallas. She is a proud graduate of Texas A&M University, where she earned a Bachelor of Arts in Communication with a journalism minor. Angela also writes for MediaBistro’s 10,000 Words blog and TexasMonthly.com, and she once interned with the TV news magazine “Dan Rather Reports.” Her work has been republished on Editor & Publisher, the American Press Institute and more. When Angela is not busy with PBS MediaShift work, you can find her watching “How I Met Your Mother” reruns, watching Aggie football and attending indie/folk concerts in Dallas. Follow her @angelawasheck. My question is where was the city’s African American press represented on the panel? The Chicago Defender? The Chicago Crusader? WVON Radio? The Chicago Citizen? Were they invited?